I love every moment I spend in Eagle Harbor! I always marvel at the strength of Rawlings’ characters and their resilience in times of trial, and Jessalyn and Thomas’s story is no exception. Inspiration is beautifully woven through their journey, and my heart was stirred for this couple and the struggles they endured. Love’s Winter Hope is a tender tale of faith and forgiveness and one I highly recommend! 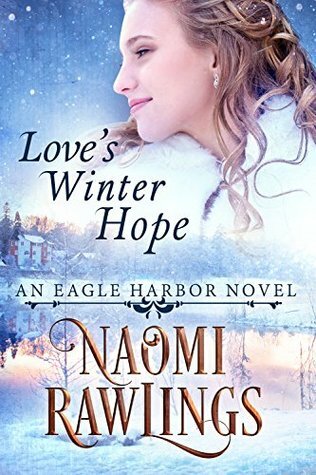 Love’s Winter Hope is Book 5 of the Eagle Harbor series and can be read independently of its predecessors. However, reading the series in order has allowed me to come to know and love this historical Michigan town and its residents, and I delight in the opportunity to return with each release. When Jessalyn Dowrick’s husband left her and their three daughters to head west five years earlier, she had no choice but to pick up the pieces of her broken life and continue without him, eventually supporting herself as Eagle Harbor’s seamstress, and secretly hoping her husband would return. But days soon slipped into months, and months into years, all without word of Thomas or a cent of the money he’d promised to send. While working day and night to build a new life that his wife would be proud of, Thomas wrote Jessalyn every week, asking her to come to South Dakota. But she never arrived. In fact, she never answered a single one of his letters. When he returns to Eagle Harbor in search of answers, he finds a woman who thought him dead . . . and soon regrets he didn’t come after her earlier. As winter closes in and storms trap Thomas in town until the harbor opens in the spring, will he be able to convince his wife he’s worth a second chance? Learn more about Love’s Winter Hope and purchase a copy.